Buttermilk may be a good choice for the lactose intolerant and those seeking to reduce caloric intake. Seek out the “cultured” or “Bulgarian” buttermilk for the best options. Here is a nice summer dessert that the whole family can enjoy, guilt-free, and lactose-free. From Southern Living. 2. Pour strawberry mixture into freezer container of a 1 1/2-qt. electric ice-cream maker, and freeze according to manufacturer’s instructions. (Instructions and times may vary.) Garnish, if desired. Add sugar to buttermilk, and stir to dissolve sugar. Add mint and pineapple (with juice). Begin freezing. If you’ve been to one of the Brazilian churrascaria’s, you were probably really impressed with the food. I was. It was all good. But, my favorite thing I ate there, what I ate the most of, and then tried to recreate at home, was a Grape and Gorgonzola salad (from Tejas de Brazil). I went back to the salad bar just for that 3 times! I know a few other people who are hooked on that salad, also. Well, this is pretty much it, with the addition of the fennel. I think celery would be good, if it’s not bitter, and some walnuts would also work well in here. Another great summer side dish that would go well with some grilled meats. Just trying to keep the kitchen cool! Combine all ingredients and mix well. Refrigerate for a few hours before serving. Serve chilled. 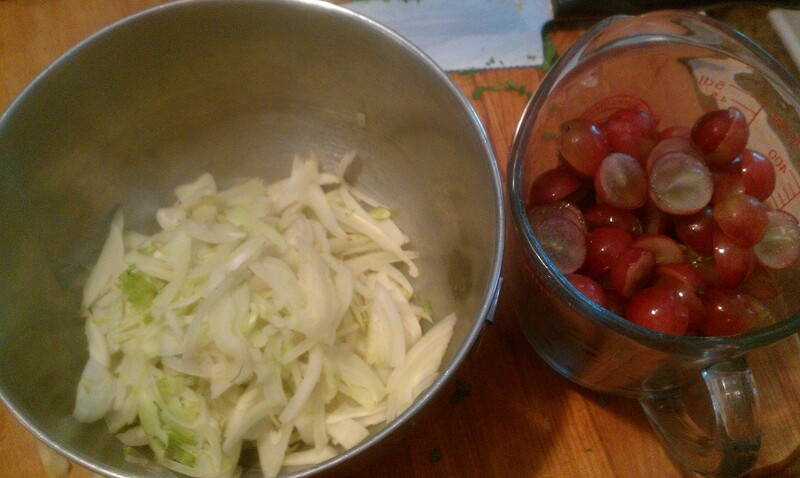 Sliced fennel bulb and halved grapes.